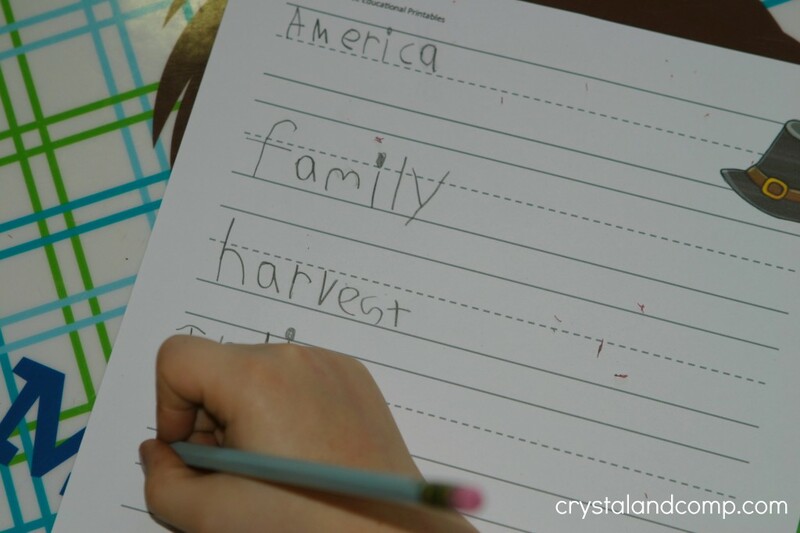 If you are looking for handwriting practice for kids, I have the perfect printable for you! This one is themed for Thanksgiving. There are three pages, so it gives the kids a choice and allows you to use them i n many different ways. I used one sheet of these for my four year old to do his name practice on. He loved that. I let my two seven year olds use the other sheets to do some copywork with Thanksgiving vocabulary words on them. 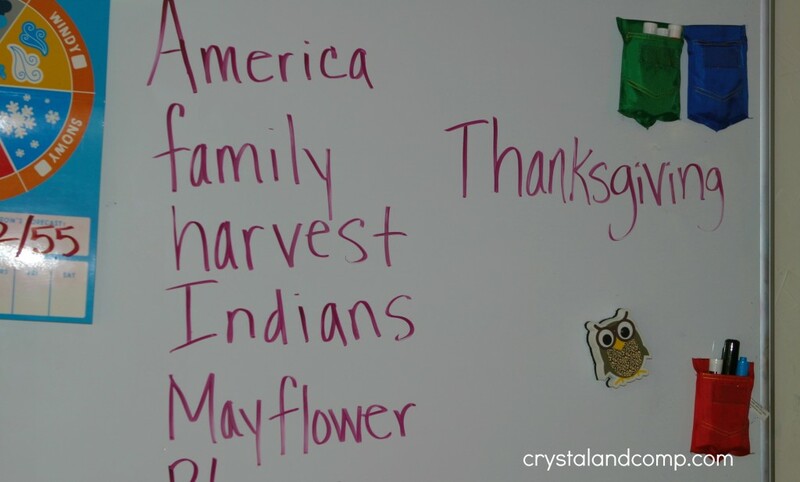 I wrote a collection of Thanksgiving words on our dry erase board by the kitchen table where we do all of our homeschool work. The words I included are in the image below. Pilgrim was one of them, but I chopped it off in the photo because I spelled it wrong. CRAZY, I know. I totally was not paying attention. My boys busily worked to write them. They did not write each word using the lines properly, but we are working on it. You could also use these printables for your kids to write a Thanksgiving story on, share a letter giving thanks, and so much more! After we did the Thanksgiving vocabulary, we spent some time reading our favorite Thanksgiving books for kids. Thanks for the printable and sharing it with Afterschool! I want to ask my 7 year old to come up with her own Thanksgiving words for it! These will be great for my kindergarten son. He is making that transition from writing on blank paper to writing on lined paper… and driving his teacher insane in the process. I think he’ll like writing on these themed pages. Thank you for sharing your printables at After School!